PESA’s Credit Interchange Division (CID) provides a unique opportunity for member companies to exchange business intelligence and interact with experienced credit professionals. Through the confidential exchange of up-to-date ledger experience, members gain access to a database of over 50,000 ledger entries on nearly 10,000 existing and potential customers. 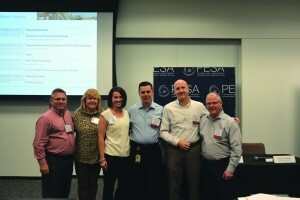 With a focus on broader engagement, the PESA CID Operating Committee is expanding the CID network by recruiting new members and adding the role of CID Advisory Board Liaison to the Operating Committee which includes representation from DistributionNOW, Halliburton, Nabors, Key Energy Services, Schlumberger, Select Energy Services and TETRA Technologies. In the past year, CID has welcomed nine new members and divisions including Atlas Tubular, BJ Services, GR Energy Services, Greene’s Energy Group, M&M International, Oil States Energy Services, Scientific Drilling, Warrior Energy Services and Weir Oil & Gas. Increasing membership ensures quantity and quality of information available. With more than 60% of participating companies participating in automated file submission, the system credit histories are continuously expanding. The Operating Committee plans to continue driving engagement by hosting more networking, social and educational events. CID members met at Saltgrass Steak House for this year’s first social event in January and will host another luncheon on March 23. The socials are open to all credit personnel. Those who are interested in attending should contact meetings@pesa.org for more information. The next topical seminar is scheduled for May and will cover collections trends and Credit 101. The Operating Committee will also provide a briefing at the PESA Annual Meeting covering membership activity, benefits and an overview of the CID Annual Meeting which is scheduled for October 18-20 at DistributionNOW in Houston. If you know of a company in the oilfield that would benefit from PESA CID membership please contact info@pesa.org.